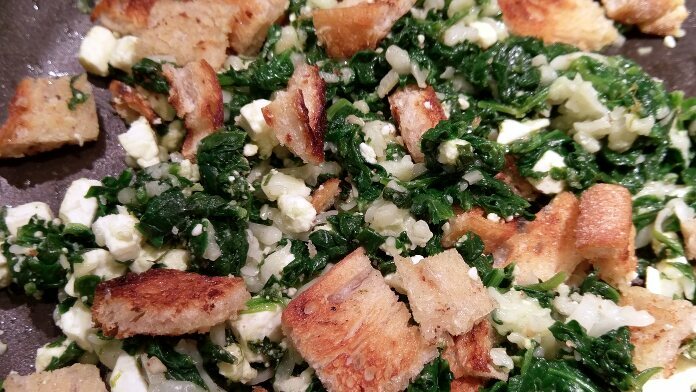 The Greek spinach pie is reimagined into an Italian-style salad! Cheesy, crunchy, vegetable goodness makes a simple and perfect summer meal. Mince garlic. Chop dill leaves, discarding stems. Rinse the spinach, of course, and dry carefully. Halve tomatoes. Heat olive oil in large, nonstick pan over medium heat. Add garlic, then add spinach. Sauté three or four minutes, until spinach has wilted and garlic is fragrant. Remove from heat. Season with salt, and stir in feta and dill. Cut toasted bread into 3/4 to 1 inch pieces. Return pan to medium heat and add mozzarella and bread. Stir to combine ingredients, no longer than one minute or until cheese is beginning to melt. Remove from heat. Stir in tomatoes. Divide between two plates. Enjoy! You can exclude the tomatoes if you like, but if you add them, be sure to do so only after removing from the heat.